Auntie Pearl is my favourite auntie! Whenever I get into trouble with mummy, she always helps me out. She takes me out and buys me treats on her way home from work. I’m no longer mad that I have to share my room with her. She is fun! She tells funny tortoise stories at bedtime that make me laugh and when mummy pokes her head round the door to find out why I’m not asleep, we both make snoring noises so mummy thinks we are sleeping. He he. Aunty Pearl cries a lot but she tries to hide it. Sometime she comes out of the bathroom and her eyes are red, like mine after mummy’s spanked me for being naughty. It makes me sad. I asked mummy why Aunty Pearl always cries and she told me to mind my business. Hmph! Nobody tells me anything, they say I’m only a little girl but I’m 7! Hmph! She told me! She told me why she cries a lot. She misses her husband. They had a fight that’s why she came to live with us. She says she can’t have babies so her husband doesn’t love her any more. God, please let Aunty Pearl have babies so her husband will love her. She is sad without him and I don’t want her to be sad. She cries a lot God, please don’t let her cry any more. Amen. Aunty Pearl has gone. I’m sad but I’m happy too. Can I be sad and happy at the same time? Her husband loves her, he came to the house to tell her. He is nice, I like him. His name is Uncle Kenny and he’s REALLY tall, like a giant. He carried me on his shoulders and I touched the ceiling! He he. He said I can come and visit anytime and Daddy said I can go as long as it’s during the school holidays. They live in Port-Harcourt though so Daddy says I’ll have to fly in an aeroplane!!!!!! I’ve never been in an aeroplane before, I can’t wait! I’m going to Port-Harcourt tomorrow! Daddy said I have to come back before Christmas though so I’ll be back in Lagos on the 22nd of December. Mummy told Aunty Pearl she mustn’t spoil me while I’m out there and she agreed but when I spoke to Uncle Kenny, he said I’d be so spoilt, I’d be rotten and they would have to throw me away. He he. Adults say silly things sometimes. I’m in Port-Harcourt! The plane was scary! It kept shaking and I cried all the way. The lady looking after me said it wasn’t always like that but it was really windy so the plane had to fight the wind. I don’t know if I believe her but I’ll try one more time. If it happens on my way back to Lagos, I’m never flying in a plane again! I like it here. Uncle Kenny’s house is big, bigger than our house in Lagos. He has many cars. I think he is very rich. Auntie Pearl took me out for ice-cream this evening and when we got home, Uncle Kenny had loads of DVD’s for us to watch. We watched Shrek. The donkey was so funny! Uncle Kenny said there’s a part two and three so we’ll watch them tomorrow. I love Port-Harcourt! Auntie Pearl beat me today and I cried! It wasn’t my fault that I broke the handle of the kitchen door. She told me to get her a glass from the kitchen and when I tried to open the door it wouldn’t open. I went back to tell her and she slapped me and said I was a lazy girl. It really hurt so I cried. She said I shouldn’t come back to the living room unless I had the glass with me so I tried really hard to open the kitchen door and the handle fell off. She beat me with her belt and there are marks on my arm. They hurt. 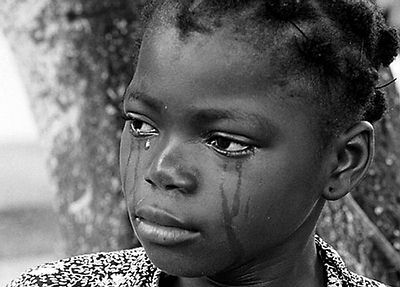 I was still crying when Uncle Kenny cane home from work and when he saw the marks, he was angry with auntie. I could hear him shouting and I was scared so I went to my room. Not long after, auntie came into my room with the belt in her hand. She said I came to her house to destroy her marriage and then she beat me again. I didn’t tell Uncle this time. I don’t know why auntie doesn’t like me anymore. She treats me differently and doesn’t talk to me unless she wants to send me to get something. I tried to hug her yesterday and say I was sorry I broke the door handle and she pushed me away. I wanted to cry but I didn’t so Uncle wouldn’t get angry with her again. I still like Uncle, he’s nice to me. He took me to the amusement park today and we had fun. Auntie didn’t come with us, she had a headache. We went to the supermarket and uncle bought me plenty of toys and a new dress! I really like it! It’s yellow and has black flowers all over it. We had dinner at Chicken republic before we went home. Auntie didn’t look happy when we got home. She asked Uncle why he was carrying me when we walked in. She said if my legs weren’t broken, I should get down and walk. Uncle put me down, kissed my forehead and told me to go to bed. I tried but I couldn’t sleep. Auntie was shouting at Uncle and I could hear her. I want to go home! I told Uncle Kenny to call my Daddy, I want to go home! What have I done to auntie? Why does she hate me so much? This morning we all went to church together but Uncle had a meeting so he didn’t come home with us. As soon as we got home Auntie told me to go to the kitchen and chop some onions. When I told her I didn’t know how, she got angry and called me a spoilt brat. She dragged me by ears to the kitchen and told me to start chopping the onions. I wasn’t happy anymore so I told her I didn’t want to chop onions, I wanted to go home instead. That’s when she started beating me and shuting at me. She said I’m a prostitute, that I came to her house to steal her husband. I don’t even know what a prostitute is. She pushed me to the floor, took off her belt and wouldn’t stop hitting me. I screamed and screamed but no one came. I think I slept because when I woke up, I was in Uncle Kenny’s bed and he was stroking my hair. He said he was sorry for what auntie did but I still wanted to go home. I tried to move but my body was paining me. I started crying and told him to call my daddy. Daddy sounded angry. He said he had missed the last plane but he would come and get me first thing in the morning. When Aunty Pearl came into the room I screamed until uncle told her to leave. I made him promise not to leave me so he lay beside me and sang silly songs to make me feel better. His voice is funny, just like mummy’s voice. Daddy is here! I’m going home. I hate Port-Harcourt and I’m never coming back. I hope I see Uncle Kenny again. He promised to buy me a Nintendo Wii if I come first in my class!